Submitted by Mehrdad995 on Thu, 2018-09-27 06:42. Submitted by 111 on Tue, 2017-11-07 09:18.
subdividing the spline? you can do it with Spline Normalize modifier before glueing your spline. Submitted by Despondo on Thu, 2017-07-13 07:59. 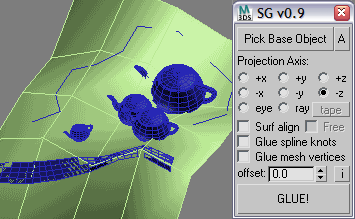 Can you add spline interpolation like the Glue utility has? I'd like to use your script, but it lacks this critical feature. Submitted by syedsaudshahid on Thu, 2017-04-06 08:37. Great Script Andrei, Is it possible to have base object to select a list of surfaces option ? Submitted by Artie on Fri, 2011-09-16 04:28. Andrei, Thanx very much for this script. Looking forward to new features. squeakybadger, use Macrotize script to do that. Submitted by 111 on Thu, 2011-09-15 14:52. Submitted by squeakybadger on Fri, 2011-08-05 09:53.
is it possible to install this as a macroscript? Submitted by donvella on Sun, 2010-07-25 18:10. Thank you mate, awesome script you got here. Submitted by dutch on Tue, 2010-01-12 12:32.
great script, just one small request: use the glued object local axis to project. Submitted by rs3d on Wed, 2009-11-25 02:44.